Denis Ndeloh – Etiendem Ph.D.
— Denis Ndeloh – Etiendem Ph.D. Growing up in rural Cameroon, Denis learned about gorillas from his father who hunted primates and other wildlife as a source of protein and income for his family. His father narrated stories about his encounters with primates – stories which were often imbued with superstition, power, totemic relationships, and empathy. Denis owes his interest in the study and conservation of gorillas to these early experiences. Given this background, As Director of Great Ape Field Research at The Gorilla Foundation, Denis seeks to develop and sustain strategic conservation education and research partnerships with indigenous people groups and organizations working in gorilla habitat countries. 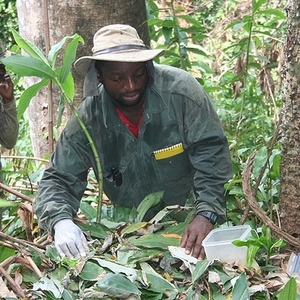 He has received many awards for his groundbreaking work with the people and gorillas of Cameroon, including TGF’s Wildlife Protector Award in 2009-10. Dennis Ndeloh, you’ve been so gracious to share your time with us today and you grew up in Cameroon and you’ve been involved with the study of great apes around the world. You’ve actually spent over a decade of your time working with the most endangered group of those awesome animals. The Cross River gorilla, if I’m not mistaken, I’ve read some about them and it’s amazing. The study you’ve done and just the creatures themselves are just awesome. You’ve got your Ph.D. a few years back and you’ve been educated all over the globe, you’ve spoken all over the world and you’re doing an amazing work to bring a lot of awareness and a lot of health to the animals themselves and also to the humans that get to interact with these awesome, awesome creatures. So, tell me a little more about what you are doing today, where are you at, what are you doing right now and then we’ll get into the questions. Thank you Chris for having me and I want to give a big shout out to your listeners for letting me inspire them today. I describe myself as a family person who is very passionate about nature, about animals and also who is very, very passionate about gorillas of course. Today, I am talking from Gatineau, Quebec in hope of pursuing a post-doctoral study on the Cross River gorillas. In this study, I will be looking into the common parasites of Cross River gorillas and humans that live in the same ecosystem and try to establish if factors such as human disturbance influence the parasite infections of Cross River gorillas and vice versa with the hope of making recommendations that can help not only conserve the animals, but also improve the health situation of the people that live in the forest areas and communities. So you’re in Canada doing more research and more study, you’ve spent a lot of years in the classroom and in the jungle. You grew up around these animals, right? What was it like growing up? I mean were you in a jungle area literally? I grew up in one of the most remote places in Africa. Our house where I spent the first 19 years of my life is just some 40 or so kilometers from the nearest Cross River gorilla habitat. Actually, it was very difficult growing up. I mean our parents depended on agriculture, on hunting to feed your family with many children. There are 18 of us in total. My father had two wives and 18 children in total. It was a challenge for him even to educate us. I mean I didn’t learn a word in English until I was seven years old or something. When we eventually got the opportunity to study, I was fascinated by the stories that my father told me about the animals in the forest, those that he hunted. These animals, his encounters with them, living or dying, as I usually refer to it, he tells us of animals that will charge him, he tells us of animals that will stalk him and he tells us of animals that were dangerous, those that were easy to catch and so on. One particular story that picked my interest was my father’s recollection of an encounter he had with a chimpanzee. That was my first time knowing about chimpanzees. I didn’t know about chimpanzees before. I just saw my father bring home some monkeys and monkeys were monkeys, you know? He told me the chimpanzee stalked him, intentionally stalked him and preventing him from moving to the forest and would make a lot of noise and would stand up erect and will move around and will shake trees and will make a lot of hooting sounds. My father said for the first time he was afraid being in the forest. When he eventually found a way to go past the chimpanzee, actually what he did was he also started barking like the chimpanzee, the same thing that the chimpanzee was doing. He did the same thing out of confusion, not knowing what to do to send the animals away. He was not having a gun. He actually had wires meshed in the forest. He actually didn’t hunt with a gun, so he could not defend himself. He’s like, okay if I do the same thing the animal is doing but maybe do it more ferociously, like be more aggressive about it, I may dominate. That helped him, but on his return the chimpanzee had come to the same place and was waiting for him. So, he had to look for a different way to go across a certain river to come home that day. That story, to me, even as I narrate today, remains very inspirational because it immediately set up something in me. Why would a chimpanzee stalk a human? How are they able to walk, to stand upright and behave like humans? I wanted to know more about these animals. This is what my main inspiration was to studying the great apes. Well, you’ve accomplished your goal, you know more. Know more than most people on the planet know. It’s great. Well, let’s go after the five questions of hope. I’m just as crazy as it can be about where we’ll end up here. Question 1: What’s your definition or your favorite quote about hope? How do you define hope? To me, hope is a belief that a better day will come, that if you try harder, adversity will not prevail. I can say that if you don’t hope, how can you expect? If you don’t hope, how can you desire? How can you even plan? How can you reach? So, you need hope to endure the unhearing patience that is sometimes required to attain your goals because when you try and it’s not working, if you do not have hope you’re going to give up. Hope is something that makes you not give up. So, my definition of hope comes back to a belief or that thing that makes you want to overcome, that makes you know that at the end of the tunnel there is light. Good, good definition and explanation there. Wow. I’m going to go back and listen to that again once we’re done talking just to write that down because that’s a really good way to explain hope. Thank you. Question 2: With that definition, that kind of working pattern of hope now, who would you say has shared the most hope with you in life? I will say two people. I will go back to my father, his enduring commitment to the education of his children at a time when most people around him did not think it was worth the risk. With no income, little income, many children – many people just say “teach them how to hunt”, “Teach them how to farm and they will be okay.” Even though he was not educated, even though none of his wives were educated, he believed in something greater. He had heard, he only had heard from people that education is a good thing, but he believed in it. His hope that education would translate into a better life has greatly prevailed if you look around his family, so my father would be the very first person that inspires me the most. Second will be Jane Goodall. Jane Goodall, you know, is a woman, who, at the age of 26 left the comfort of her country in London to travel to Tanzania equipped with just binoculars and a notebook and entered into the world of white chimpanzees. Thanks to her on hearing patience and characteristic optimism that we now know most of the things we know about great apes and about chimpanzees. You know, when I got into university when I was 19 years old, the stories that my father about apes, these man-like creatures that live in the forest not very far from my home, have inspired me and I was very interested in biological science in high school. Of course, there was never a mention of chimpanzees or anything and when I have gone to the university, I wanted to choose something that is close enough to studying apes, so I enrolled to environmental sciences. I was immediately disappointed when I looked at the list of courses and it was just pollution, waste management, environmental law and all of this. I said, “Where are the animals?” One day, I went to the school library, the library of course in the broken country, they’re not equipped, there’s not enough and there’s not so much in terms of books. I picked up a book that was titled Reason for Hope by Jane Goodall. In this book, Jane was narrating her story, her patience, how long it would take, how much she had to endure, how patient she had to be to see the chimpanzees for the first time. I mean I love to read this book so much that I even made a copy and hid it under my bed. I will read the pages over and over again as though to find something new. In those days, with nothing to go for but a book of somebody who has given up so much in order to study these animals, I was inspired. I wanted to be like her, you know? It was challenging because in my country, if you want to be a primatologist – I think this is not only limited to my country, then you are signing a poverty contract, right? Because you’re never going to be rich. You’re going to apply for funding all your life. You’re going to beg money from people to do the work that you do all your life because you’ll never have anything to go for yourself. You can do computer science, you can go and be a journalist and you can easily find a job, but there was something else that was driving. What I’ve read in the book and the stories that my father had taught me was what was driving me. I wanted to go – that was where my heart was and I was just hoping that something will come out of it. In a country where unemployment is at 80%, it is, in some people’s view, stupid not to go for the subject that has a greater probability of landing you a job. But, due to these inspirations I’ve mentioned, I could not see myself not doing it. I kept at it even though I didn’t see how I’m going to get to know primates from that course, but that was the nearest to what my heart desired at the time. Those are great examples of people sharing hope with you and two awesome examples, your father and Jane, just such a rich history. It’s interesting Jane left the comforts of a more civilized and comfortable lifestyle to go spend so much time with the apes and yet your father from the other side didn’t come from that comfort and had a very intimate knowledge with them as well. Just pure proximity and time that both of them took and have set you on a path. It’s just awesome to watch. I think that we can through this difference, this divide through genuine conversations and hoping that people will be transformed, that compassion and empathy would take over. This has been my approach. As I go to communities and I talk to them about apes, I don’t go you know what, the forest is threatened, apes are endangered, we have to stop it. I say imagine that a young chimpanzee mother who has just given birth to a baby, when you take out that gun to shoot that chimpanzee, imagine your wife and your daughter. Imagine somebody doing that. I try to let them know that like us, chimpanzees have emotions. Like us, animals can think, animals do suffer and they do go through trauma. When people connect to that, sometimes it’s difficult, sometimes in some societies where traditional belief systems exist, where people believe in the trans formative power of animals turning into totems, inter species relationship as you can say, is much easier because you can say look, you guys believe that if a chimpanzee or a gorilla totem is killed, somebody would die in the community. So, why do we kill them if we don’t want people to die? It’s much easier. You are not using this scientific approach, but you are learning from people because you know the way they think. This is always – I say that I am lucky to have come from two worlds, that the son of a hunter would become a protector. We can replicate this across the planet in everything that we do towards sustainability. I think it would be a better world. Great pattern. This is a great patter you’re following. Tell me more about you then. Question 3: When was a time in your life when you’ve really had a hopeless situation and something where you had to really pull through that was hard? You’re experiencing a lot of success now and you look like you’re on top of everything, but that’ not always the case. Give us a little background, paint the picture, what’s going on for you back there? Okay. I could say some instances. The most difficult one was of course the challenges of growing up. I mean it was not easy and just to keep at the north star even when you’re surrounded by poverty, by everything, the struggle. That was very difficult growing up, but most interesting is I’ll go back three or four years ago when I was already in the stage of collecting data for my PhD thesis. This was like one of the stumbling blocks. I just left the forest, after a month of searching and finding the gorillas and I actually started to find the gorillas and I knew that somebody was out there waiting for this good news and as I stepped out to go talk to my supervisor, whilst in the car moving towards the city where she lived, I heard that she was murdered that morning. It was difficult. It was, why should we do this anyway? Why should I trek 10 days repeatedly every day in the forest wandering in search of animals when at the end it means nothing? Why should I endure? At that time, the villages were having issues with wildlife conservation and they were threatening us. You wake up one morning and you see a mob of 80 people arrive at your camp wanting to march you out of the forest, that don’t want you in their forest. Why should I endure all of this? Hey, there has got to be something better out there. Life should not be this tough. I was surrounded with all of that and you know what I turned to? I turned to a discussion that I had with Jane Goodall in Belgium when she was visiting, that was before I ever started my PhD. I asked Dr. Jane, I read in one of your books that there times when you go for months and months and you don’t see any signs of chimpanzees, the times when the winds were unbearable, what kept you going at that time? Her response to me was, one, on broken love for nature and two, the stubbornness to quit. When all of these thoughts went through my mind, when I was saying that I will not go back to the forest of prejudice and that there can be no way I can go, I can continue with this project, I thought about that. I thought about the stubbornness that you must summon in order to protect these animals. They cannot say thank you, the animals cannot say thank you. But, what would be the legacy of my supervisor or why would I say my supervisor died if I quit? She was in Africa because she believed not only in the protection of apes, but she believed that we have to nurture the next generation of African primatologists in order to save primates. She believed that we cannot depend on foreigners alone. We must enhance the capacity of the local people if we are going to see any difference. So, should I give up on that premise? Should I just be a coward and go away because she’s taken away from me? That was my decision to go back the next week. I worked even harder and asked even more questions for my data and walked even longer distances per day in search of the animals and to study them. It was one of the most difficult decisions that I’ve made. The most difficult and the most challenging circumstance that I came across. There might be others, but this was the one. Yes, that makes a lot of sense why it would be particularly from a mentor standpoint. You just had somebody so close to you. Did she get murdered by people who did not want her involved in the conservation effort? Do you know? No. It’s still not very sure. We don’t know if it was related to robbery or it was related to – it’s still not sure even up to today and I just stopped asking the question. I don’t want to put blame on anybody. I’m not trying to do that. Yes. It’s a part of the world where crime can go unpunished. That’s the reality. I’m so glad you’ve come through and I’m so glad you had the support of people in your past like Dr. Jane and your past mentor and also the people that were in your life at that point when you were producing your thesis, working. You’re doing so much that you had a lot of other advisers around who could say yes, keep going, you’re right and have that stubbornness and we’ll back you on it. Keep going. That’s unusual to have, the support and it’s been great that you have and you’re obviously a very stubborn man, so I hope nobody gets in your way. So, you’re doing a lot with the research and with communicating the story of the apes that you’re studying, but you know a lot of us aren’t PhDs and don’t have the speaking ability that you have and the connections you have now. So, what are you doing as a regular guy every day to share hope? As a regular guy, my message to everybody is it’s not too late. It doesn’t matter what you’re going through in your family. It doesn’t matter if you’re walking or you’re climbing a hill that looks so steep, if you believe that you can make a difference, it doesn’t matter if anyone else is willing to join you. I would say that in a house full of people, say 10,000 people, it takes one person to stand up, hoping, just hoping that another person will. If you don’t want to be that first person, if you sit down because no one is standing up, nobody will stand up. Maybe you are the person who is supposed to ignite the change and stand up. You must take that opportunity when you feel that it is time. You must stand up and hope that another person will stand up. It takes one person to stand up for 10 to eventually stand up, for millions to stand up and for us to change the world. What I say is there are thousands of reasons why I should not have been successful. I was born and raised in one of the most remote corners of Africa. My parents were illiterate and did not speak any English before until I was seven and I don’t think they speak good English. For seven years, I had to trek two hours to and from primary school at an early age of six and for the most part walking on bare feet because my parents could not afford shoes. My story is why you must never allow your difficulties or your challenges to overcome you. My story is why you develop an unwavering patience for the right moment to come. My story is why you believe so much in what is to come that you set forth to grab it. Why in the darkness, you keep going knowing that somewhere you’re going to bend a corner and at that corner you will see some light. You must be stubborn to the voices that ask you to quit. This is the message that I take along with me wherever I go. I like to be in communities with people who are experiencing all sorts of problems and instead of speaking to them about primates, which is what I like to talk about, I always want to just know what is happening in their lives and give them courage. Tell me that you never let your fears overcome your hope. You see, when Dr. King said we shall overcome, it was powerful. It still is. But come to think of it, he was not saying that based on any plan that he had, any promise that has been made. He was not saying that based on any magical vision or any concrete thing. It was just a belief. He knew that if everybody kept at it, we shall overcome. In everybody’s lives, I mean their professional lives and especially for people who take care of animals, who try to conserve the resources that we have in this world, it’s easy to give up. Like two years ago, 300 elephants were slaughtered in one week in a Cameroonian marsh. It’s easy to say you know what, it’s over. Many people come to me say you’re working so hard to protect the Cross River gorillas. I get it, that they are the most endangered in Africa, but your story and those of others have shown that these animals, there are less than 300 left in the wild. Why not just go and study some animals where there is a reliable chance of survival into the next millennium? My answer is, what if there was just one animal left? Doesn’t that animal deserve the right to live in peace for the rest of his life? Should that animal not be cared for because all the others are gone? It applies to everything else. We just cannot give up. We have to keep fighting until there is nothing left in us. Wow. I’m learning a lot. I think you may have already answered question five. That’s what are practical steps that we can take or what do I do next to become a person of hope or to start sharing hope? I just hear you saying so many things that give a lot of action to not giving up. That stubborn determination to keep moving forward even when everybody else says it just won’t work. If you know it’s right, you need to pursue it. Do you want to add anything to question five? I think you already have answered it, but I don’t want to stop you if you got something else there. I would just say that people should learn to keep their dreams alive no matter what. Also, support the causes that matter most to you. Sometimes it takes a like on Facebook to promote an idea. I mean if you can’t donate to a cause that you’re happy to donate to, but sometimes just adding your own voice, saying a yes, saying that is true helps. A like on Facebook, as I said, can support someone, can bring laughter, can bring a moment of joy to someone who is suffering from something. So, I think that we should not give up no matter what on the things that are close to our heart and we should be ready to stand up and fight. Wonderful. I’m feeling obviously from your words because you’re a great communicator, but also the truth of them. There is so much truth and we can look back through history and see so many people who’ve changed the world because they were the one person who stood up in the room and started what everybody else probably knew was right and needed to be done, but everybody else was waiting for somebody to follow. Sometimes you have to be the person to stand up and be the leader. Well, also you’ve mentioned Facebook and I know that was a pure coincidence because what I ask next is how can we follow you? Do you have a Facebook page or somewhere we can keep up with you and find out what you’re doing, find out more about the organization you’re serving with as well as your research? I do have a Facebook page that is managed for family. I have a Twitter account and that is where I most likely will post things about my work, what I’m doing. I’ve been quiet for a while, but I will keep up with that. I just had a new National Geographic grant to go to Africa, go back to Cameroon and study Cross River gorillas. Actually, I will be looking at the influence of disease and human disturbance on stress hormones. I’m majoring stress hormones in faeces across seasons and in different habitats. I think that would be an interesting thing to do. With the Gorilla Foundation, I will also be leaving at the same time, leaving some compassionate conservation education activities, exploring how stories told by Michael, the gorilla that originated from Cameroon and that was after he’s been taught a sign language, could communicate the nightmares that he was having about his parents being killed in Cameroon to his caregivers 10 years afterwards. I’m going to use the story as a tool to encourage compassion for gorillas. I don’t think in the very remote areas, most people they see animals rightfully so if you have ever lived there. They see animals as food, but if they learn a little bit more about their emotions, that these animals do suffer, that they have anxiety, that they have nightmares, that they have feelings, maybe that would change the way they perceive animals. So, I went to use this story for our educational material alongside green day work, the post-doctoral work by National Geographic to reach as many people as I can and to inspire some compassion hoping that that could lead to one gorilla not being killed. As I said, if one gorilla can be spared, one of the 300 because of the stories I tell, because of my engagement with the local communities, I would die a happy man. That’s what I’m going to do and I will keep up with my Facebook account and hopefully, eventually write a blog someday about my work. Sorry, my Twitter is Denis_Ndeloh. Great. That’s @Denis_Ndeloh, the Twitter handle. Awesome. Your organization website, where can we find just the organization you’re serving with currently? Now, I’m serving as the director of African Field Conservation at the Gorilla Foundation, KoKo.org. You can read, they now have a CV and their biography page on that website. Great. We’ll link that and we’ll put that on the show notes page here at isharehope.com as well along with your other links. What were you going to say that was another one? I was just saying that if anybody listening would want to reach out to me and let’s discuss how we can protect more species or spread hope around the world, you can also send me an email. My email is nndeloh@gmail.com. Perfect. We’ll put that on the show notes page as well. Well, Denis Ndeloh, you have been a privilege to talk to. I can’t imagine any more fun conversation that this, a guy who gets to spend his life researching the great primates of the world and in particular a group of 300 that are the last remaining of their type. With your help, hopefully we get to 400 and 500 and keep them climbing. Hopefully so. Denis, thanks for your time. I really appreciate it. You’re welcome Chris. Thanks for having me. Your growing up in the forested areas in Cameroon and you have…did you say 18 of you? So, is there 16 children? Thirteen of you, wow. Your father was very focused on education and yet he did not have a formal education at all? How did he find out? What triggered his mind to think “I need to let my kids get to a 2-hour walk each way to school”? I think he had heard from people – he had heard both sides of the stories. His father stopped and will aggressively prevent his children from running away from home to go to school because he had sent his first child to school and when that first child graduated from school, he was so elitist that he disregarded his father. So, he, in those days where parents were very powerful, he said none of his children will go to school from then on and they never did. My father had died, but he also had heard and seen people who go to school and come back to help their parents. It was a huge investment. He had to take up hunting, carpentry as well, he was a carpenter and a farmer. Doing these three jobs just to make sure that as long as the child does not fear the exam, he is going to go to school. Thirteen children and all of you have at least one degree? Wow. From one of the most remote places in Africa and parents who did not have an education. I can’t help but notice the irony of a father who had to become a poacher in able to support and pay for his children’s education which in turn generated a researcher for primates. I’ve noticed that with many other conservations we’ve had with people around the world, sometimes the things that happen like poaching for instance, would you kill an animal to feed your children? Yes. You do what you have to do and that’s often the situation. It’s just that from a distance we can point fingers, but when you’re up close and personal you realize there’s more to this story. How can we help that person feed their children another way? Some of these hunting practices will never leave the people. They will always hunt because that is who they are. Being in the solitude of nature, sometimes it’s the medication that they need for their illnesses. Being out there in nature an hunting is what gives life and purpose for them and you must walk through this intricate, complex web of root causes in order to find a solution. That is why instead of saying not hunting, let’s make them empathize. At least the animals that we want them not to hunt, to understand with us why hunting all the animals today would mean that your children do not have anything to hunt in the future. It should not always be that because it’s a criminal act, that it is punishable by law. These people are not literate. They don’t know what is endangered. Endangered means nothing to an illiterate person. You are out there in the forest a lot. When are you just completely scared? On the contrary, each day I sleep and all the noises I hear of cars and trains passing by, I dream of a night in nature and sleeping there under the tree and believing that no animal out there really comes and get you unless it’s provoked. I have stepped on snakes. Of course you have to be careful, of course. I wear boots that at least cover some part of my foot when I’m in the forest, but I’ve never seen a snake that instead of running away, is running towards me. This is just a misconception that snakes are evil and they would just come and bite you, no. Biting for snakes as any animal is self-defense. Gorillas have charged at me, yes because I study wild gorillas, these are not the ones in the zoo that know that people come around. These gorillas are once you step into their territory, they simply want to eat you up Just as what you will do if somebody’s knocking on your door in the night and in order to protect the family, you’re going to come out and confront those. Right. What music do you like to listen to? If you’re going to put something in your headphones while you’re on the plane or in a car or out in the forest and you just want to lighten your spirits up a little bit, feel a little happier, what’s your favorite music? Anybody in the world, it doesn’t matter. What’s your favorite? My favorite musician is actually a lady. It’s Celine Dion. Celine Dion, really? I love it. Any certain song that you love? She has a beautiful voice. Actually love so many. The power of love is also one of them. No. I plan to. I mean I came to Canada last year. She has not had a lot of performance at this time because I think she is taking care of her husband or something like that. When she starts making concerts, I will definitely find the cash to go. I would really love to meet her. She is full of energy and I like that.